Last summer, my sister and I escaped to NYC for 36 hours. We packed in a show, some good shopping, and a lot of good eating including breakfast at Eataly and dinner at Momofuku. I’m pretty sure I’ve mentioned this getaway before — sorry, I don’t get out much — but after discovering that Danish pastry dough can be made in the food processor and, as a result, that cheese danishes can be whipped up in just a few hours, I found myself dreaming about other danish-like pastries, croissants in particular, ones brimming with prosciutto à la Eataly specifically. Now, the breakfast pastries we ate at Eataly were served at room temperature and filled with slices of meat sandwich-style. And while they were delicious, I was craving something more like the pain au jambon I had read about in the Tartine cookbook, in which smoked ham and cheese are rolled and baked with the dough. So, guided by Tartine, I layered thin slices of prosciutto and batons of gruyère over my faux croissant dough, and before too long, a half dozen crackly golden pastries emerged from my oven, cheese oozing from the ridges, salty meat entwined with each flaky layer. Since I just posted about the cheese danishes, I’ll keep this brief, but I’m still in awe of this dough. Without any labor-intensive butter-laminating process, this pastry dough bakes into a puff of feather-light layer upon feather-light layer. It’s astonishing. Perhaps more astonishing, however, is how the finished croissants — how so many good croissants — feel and taste about as light as rice cakes, as if very little butter went into their creation at all. How do they do that? What a sham. In any case, the possibilities with this dough seem endless — croissants aux amandes, pain au chocolat, morning buns, plain croissants perhaps made for the sole purpose of making croissant bread pudding or French toast the following day? If you are preparing for a brunch, perhaps an Easter brunch this Sunday, know that the rolled croissants can be prepared a day in advance — I stored two in the fridge for about 18 hours, and after a three-hour rise the following morning, they baked off beautifully. As with the cheese danishes, they reheat incredibly well on subsequent mornings, and when halved and toasted and filled with a fried egg, they make just about the best breakfast sandwich you could ever imagine. …they baked off beautifully. This is nice to know if you want to shape the croissants the night before you plan on serving them. Toasted, halved, and topped with a fried egg. Yum. 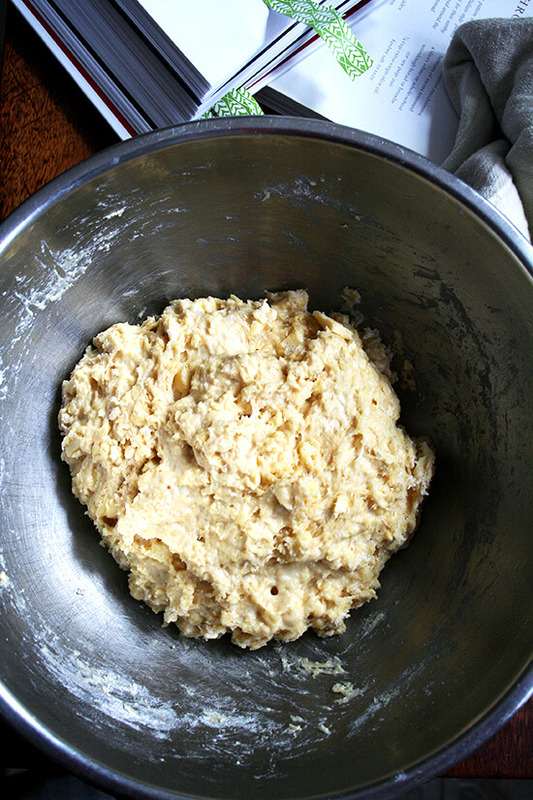 Pastry Dough Source: Nigella Lawson’s How to Be a Domestic Goddess If you want to make cheese danishes, view this post. A note of caution: these croissants are definitely on the salty side. If you are wary of salt, perhaps pick a smoked ham that is on the less salty side — not sure if this sort of thing even exists. Day-old pastries reheat quite nicely at 350F for 10 minutes or so. You will have a lot of leftover glaze if you are only making 8 pastries, but if you are prompt about putting it back in the fridge, you can save it until you get around to making the remaining 8 pastries. Make the pastry: If you are using rapid-rise yeast or fresh yeast and have planned ahead such that you know you will be refrigerating the dough over night: Pour the water and milk into a measuring cup and add the egg, beating with a fork to mix. Set aside. If you need to speed up your dough-making process or want to make sure your yeast is alive and well: Sprinkle yeast over the warm water and milk with a little bit of the sugar (I take 1/2 teaspoon from the 1 tablespoon) and let stand until the mixture starts to foam a little bit. Then, beat egg with a fork until broken up and add to milk-yeast mixture. Beat mixture with fork again until just combined. Set aside. Place a large bowl near your food processor. Then put the flour, yeast (if you haven’t mixed it with the milk), salt and sugar in the processor, and give it one quick whizz just to mix. Add the cold slices of butter and process briefly so that the butter is cut up a little. You still want visible chunks of butter about least 1/2 inch in size — about 10 to 15 short pulses. To turn the dough into pastry, take it (or half of it — I find it easier to work with half the amount of dough at this step) out of the refrigerator, let it get to room temperature (or don’t if you are pressed for time) and roll the dough out into a 20-inch square. (Note: Don’t worry too much about inches here — just try to roll the dough out into a large square that is relatively thin. Also, you will need to lightly dust your work surface with flour and add more flour as needed to your rolling pin and board.) Fold the dough square into thirds, like a business letter, turning it afterward so that the closed fold is on your left, like the spine of a book. Roll the dough out again into a large square (mine always looks more like a rectangle), repeating the steps above 3 times. Lay a piece of prosciutto or smoked ham over two-thirds (or more) of each triangle, leaving the pointed tip uncovered. Scatter the batons of Gruyère over top. Starting with the wide base of each triangle, carefully roll up each croissant, encasing the ham and cheese as you go. Meanwhile, about 30 minutes before they’re ready to be cooked, preheat the oven to 350°F. Place in the oven and bake for 15 to 20 minutes or until puffy and golden brown. These look delicious, I cant wait to try them. Thank you for the post! It sounds as though it is looking just right: a big ole mess. That truly is what it looks like when you mix the dough. Stick it in the fridge (it’s probably already there), and tomorrow when you go to roll it out, don’t be afraid to use as much flour as necessary to prevent sticking. Don’t go overboard — the less flour you add the better — but use what you must to make it workable. Watch the video (or just a minute or so of it) if you feel like it. It might help. I’ve made these once before and have my second batch in the oven. I love it. So easy to follow. My family members dived on the first batch and they were gone within minutes. Absolutely delicious. I have used bacon pieces and a perfect melt cheese with Gouda Parmesan and cheddar. Hoping it turns out just as good. So happy to hear this, Taylor! Love the idea of bacon, and the gouda-parmesan-cheddar combo sounds delicious! I know, it does that — looks like a total mess — after it’s mixed and after s night in the fridge. So glad the looks didnt’t deter you! And that the results were pleasing! My husband would have died, too, upon seeing a poached egg on one of these guys. And I’m glad that you agree that they really aren’t that difficult. Thanks for writing in! Just made these today. Plain. They’re really good. Admittedly not as flaky as yours, but I totally rushed the process along. Started at 11 and eating by 2:30, but still great. Wow, well done on the rushing. Yeah, the flakiness is more pronounced with an overnight rest in the fridge. But it’s nice to know you can rush the process along. Do you have any dough leftover? The cheese danishes are my favorite. Sono una parola MERAVIGLIOSI, appena posso tradurrò il post e poi farò questi splendidi cornetti. Hi there: I made these for the first time for a thanksgiving brunch and they came out more like a crescent roll instead of a croissant. Not very flaky. They were still yummy though. What could I have done wrong? Erin, hi, and I’m so sorry for this very delayed response! And I’m sorry to hear about the trouble with the rolls. What type of yeast did you use? And did you do the fast method (skipping the overnight in the fridge step) or did you follow the recipe pretty closely? Let me know, and I’ll try to get to the bottom of it. Oh, great, wonderful to hear this because the dough has given some people some trouble. I cannot wait to make these. Hope they turn out as nice as yours!!! Thanks, BLB! Hope you like them, too. Yummy!! We made these tonight for supper and they were delicious. We didn’t have time to make the dough so we used Pillsbury crescent rolls instead which worked perfectly. I think next time we might use a slightly more bold tasting meat (like a Hungarian salami) to bring out a bit more flavour. Yum! So happy to hear this! This looks insanely delicious. Would it work with whole wheat flour? Or even half whole wheat/half all-purpose? I’m somehow totally okay with fat, but always try to substitute sugar and refined carbs where possible. Totally counter-intuitive, I know. This recipe is so simple but so delicious. I’ve made it twice. Tonight, I cheated, and made some with store-bought puff pastry. While the homemade dough recipe you provided was better, it was still good with the puff pastry. Thanks for a great recipe! I love your site! Wonderful to hear this! And thank you…means a lot. I appreciate the video. If I ever get enough nerve up to try croissants again, it will be helpful. A few months ago I tried to make Julia Child’s croissants. The first batch was a disaster. The second batch was edible I guess you could say, but only slightly less of a disaster than the first. Rolling out the dough was challenging, even when following the directions. I didn’t know dough could be handled so easily as in your video. Thanks for the post. Good luck with them, Allison! Let me know if you have any questions. I love this recipe. I could eat these right off the page! The rolling-out-the-dough video is great too-thanks! I’ve had this pinned for so long and I FINALLY made them! I started the process last night and baked them this morning, but they did not come out right. The egg wash didn’t make the finish as shiny as your photos, and it came out more like a bread, honestly like the Pillsbury can croissants, as opposed to the beautiful light and flaky traditional croissant. I think it may have been excess flour from when I was rolling it out… or I pulsed it too long in the food processor? It’s possible that you pulsed too long, but usually the folding process is what creates those beautiful flakey layers, which makes me think that might be where things went wrong. It sounds as though you did the rolling right, though. How many times did you do the folding process? Such a phenomenal recipe. I’ve made these twice (once with ham and gouda, once with chocolate), and I’m planning on making them again to take on a girls’ camping trip this weekend. Love that the dough can be stored for so long – makes my prep much less rushed! Can these be frozen after they are made but not baked yet? Thanks so much! I’ve been saving this for a while – but they look too delicious. I am planning to make these for the holidays coming up. I would love to give to family as gifts – is there any point in the process that these could be frozen so that they could be cooked at the recipients convenience? I am thinking maybe just after they are rolled and brushed with butter. Then take out of the freezer and allow to rise before cooking. But I don’t do a lot of baking with yeast, so don’t know if this would work or not. Maybe better to just freeze after the final rise, so they’re ready to go directly in the oven?? Any helpful advise here? That’s exactly what I would do — freeze after brushing them with butter. I think if you freeze after the final rise, they might deflate when thawing, and I think you’ll definitely need to thaw them/let them get to room temperature before baking. I would look at the Williams Sonoma catalogue — they sell frozen croissants, and they are very good. I forget how they instruct to thaw, but my in-laws served them one Christmas, and the method worked perfectly. Good luck! Hi. The pics really reminded me of a croissant I had in my hometown. I tried to make them amd they looked nothing like yoir beautiful pics. I cooked them for a long time to try to get them brown. I dont know what I did wrong. I would love to try the recipe again. I didnt use a mixer..do you think thats what went wrong? Any suggestions would be greatly appreciated. Thanks. I don’t think not using a mixer would have been the issue. It is possible you used too much flour. A kitchen scale would help eliminate any error there. Did you do the overnight rise in the fridge? And did you do all the various folds? Just to add to my comments. Is it possible I added too much flour? They were not flakey. Hopefully I can try again and get it right! Maybe thats what I missed..I am gonna try again. Thanks for responding? I would love to hear your input on how homemade pastry tastes different and noticeably better than store-bought. Is it richer? Lighter? Flakier? I would say all three! I find store-bought puff pastry to be dry sometimes, too, and this is not dry—it’s just as you say: light but rich (buttery! ), and super flaky. love the danish processor method, great time saver, I’m also very unhappy to come across “refrigerate overnight” in any recipe, this recipe though is wonderful, love savory Danishes! The prosciutto and gruyere pairing is nice too! Thank you for this recipe! Full disclosure: I’m a professional, so blitz puff pastry and dough lamination are concepts I’m familiar with. But. I’ve never considered blitz Danish dough, and for that reason I really don’t make Danish at home because it’s a pain to do in smaller batches. This recipe made me nervous, but was so highly rated I had to try it. I followed the recipe, but I did scale it up 50% to make 2 dozen croissants. I even used instant yeast, which made me nervous due to the overnight rest. I did 3 book folds instead of envelope folds, and sweated through a 90 minute prove that appeared to provide no lift – and fretted that my yeast was dead (why didn’t I prove the yeast first like you suggested…). Halfway through baking my house smelled like the bakery I worked at while I attended culinary school. The croissants rose and colored beautifully, and there was very little butter leakage. I wonder if I used active dry yeast and rested and turned the dough a few more times if I’d get even better lift or just end up toughening the final product? I’m excited to play with the variables, but thank you so much for a beautiful recipe just as it is!